The Wright Brothers weren’t the first humans to fly. That honor might go to men such as Jean-François Pilâtre de Rozier who flew the first manned free balloon flight in 1783. Neither were they the first to fly a “manned, powered, heavier-than-air craft”. Clément Ader accomplished this over a decade before the events at Kitty Hawk, flying his steam-powered contraption 160 feet in 1890. Many even argue the Wright Brothers weren’t even the first to fly a “manned, powered, heavier-than-air craft that could be sustained and controlled”. Men like Augustus Moore Herring, John J. Montgomery, and very possibly Gustave Whitehead flew machines that may have technically qualified to meet this description all prior to Kitty Hawk. And this is not even to mention that Alberto Santos-Dumont was the first man to fly such a craft capable of “taking off under its own power”, which he did three years after Kitty Hawk. What the Wright Brothers did do was revolutionize the world of flight by designing the first true control system (three-axis control) that would result in the world’s first aircraft capable of being controlled without requiring such primitive methods as the shifting of one’s body weight. (In fact, their first U.S. patent, 821,393, did not claim invention of a flying machine, but rather, the invention of a system of aerodynamic control that manipulated a flying machine’s surfaces.) 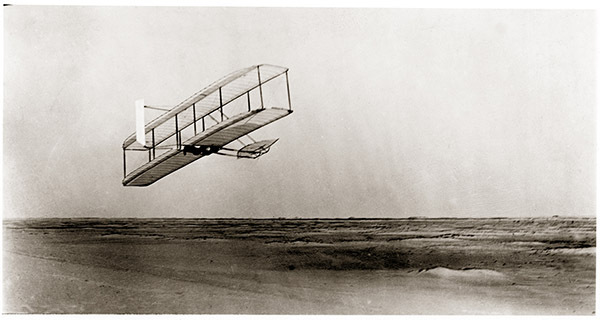 The design invented by the Wright Brothers is used on essentially all aircraft today, and is what led to the first “practical airplane design” in the eyes of today’s historians. Here are some of the inventors who preceded the Wright Brothers, some of whom the Wright Brothers themselves studied and benefitted from along their path to being the first to truly “master the skies”. Englishman George Cayley is credited with the first major breakthrough in heavier-than-air flight. In 1799, George Cayley set forth the concept of the modern aeroplane as a fixed-wing flying machine with separate systems for lift, propulsion, and control. Discovering and identifying the four aerodynamic forces of flight: weight, lift, drag, and thrust, he designed the first actual model of an aeroplane and diagramming of the elements of vertical flight. A young boy, whose name is not known, is reported to have been the first to fly one of his gliders. Over 50 years he made improvements to the gliders, including modifying the shape of the wings so that the air would flow over the wings correctly, designing a tail to help with stability, and using a biplane design to add strength to the glider. With the backing of the French War Office, Ader developed and constructed another bat-like designed aircraft, the Avion III. This one was larger, having a 15 m (48 ft) wingspan and propellers powered by a 30 hp steam engine. It also introduced a rudder to solve the issue of controllability. According to most sources, the first flight was a failure however as it crashed before ever leaving the ground due to a gust of wind. The French military also cancelled further funding. This aircraft is notable for being the first aircraft incorporating flight controls and a shaped airfoil. On 28 August 1883, John J. Montgomery was reported to have flown his craft for a distance of 600 feet on its first flight. By moving the control level for the movable tail surface, he could control its flight to take advantage of wind conditions. The flight occurred at Otay Mesa near San Diego, California. This was the first reported instance of “controlled” flight of a “heavier than air” craft. Over the next 10 years, John J. Montgomery (who had a Master of Science degree) continued to study the lift effects of various airfoil designs. In 1894, his design and experimental results were published in summary form in Octave Chanute’s “Progress in Flying”. The Wright Brothers read this book. John J. Montgomery continued to focus on the stability and control of aircraft using empowered configurations. He was the first person to use the term “aero plane” and wrote a booklet with that title. He was granted the first “aero plane” patent in 1906. Samuel P. Langley would add power to gliders by way of a steam-powered engine, allowing his (unmanned) model to fly for three quarters of a mile in 1891. A few years later, on November 28, 1896, his “Aerodrome No. 6” model flew 4,200 feet at about 30 mph. Though the aircraft was stable, there was no method of steering the craft. Still, the US War Department was impressed enough to contribute $50,000 toward the development of a person-carrying machine, along with $20,000 from the Smithsonian. However, in 1914 the Aerodrome was modified and flown a few hundred feet by Glenn Curtiss, as part of his attempt to fight the Wright brothers’ patent. Though the courts upheld the patent, the Smithsonian would go on to display the Aerodrome in its museum as “the first man-carrying aeroplane in the history of the world capable of sustained free flight”. This would remain the case until 1948 when the famous Wright Brother’s “Flyer” would finally take its rightful place in the Smithsonian, and in history. Working in conjunction with his brother Gustav, German engineer Otto Lilienthal made over 2,000 flights in gliders of his design starting in 1891. He was the first person to make well-documented, repeated, successful gliding flights and to fly long distances. In 1891, Lilienthal’s flights covered a distance of about 25 metres (82 ft) and by 1893, would achieve distances as long as 250 metres (820 ft). Gustave Whitehead designed and built gliders, flying machines and engines between 1897 and 1915. There are articles and eye witness accounts supporting the claim that he successfully flew a manned, powered, controlled flight even prior to the Wright Brothers. Whitehead’s claim is supported by such respected sources as Jane’s All The World’s Aircraft, an annual aviation publication founded in 1909. And in the state of Connecticut, a law specifies that “Powered Flight Day” is established to honor the first powered flight by Gustave Whitehead, not the Wright Brothers. Following his pioneering work in airships, Santos-Dumont constructed a heavier-than-air aircraft, the 14-bis. While mainstream aviation historians still credit the Wright Brothers with the creation of the first successful heavier-than-air flying machine, organizations such as the Aéro Club de France and the Fédération Aéronautique Internationale (FAI), as well as the entire country of Brazil for the most part, recognize Santos-Dumont for this honor. The main reason for this is that the Wrights used a launching rail for their 1903 flights and a launch catapult for their 1904 and 1905 machines, while the aircraft of Santos-Dumont flown in 1906 had wheeled undercarriages and therefore was able to “take off under its own power”. Orville and Wilbur Wright, two American brothers, inventors, and aviation pioneers, are credited with inventing and building the world’s first successful airplane and making the first controlled, powered and sustained heavier-than-air human flight, on December 17, 1903. Their fundamental breakthrough was their invention of three-axis control, which for the first time ever made fixed-wing powered flight truly possible. To address the issue of control, the Wrights constructed their own wind tunnel with a measuring device capable of calculating lift and drag of the various model-size wing designs they created. This research led to their design of the first manned heavier than air flying machine that was mechanically controllable in all three axes: pitch (which they addressed via a forward elevator (canard), roll (which they accomplished through wing warping) and yaw (for which they used a steerable rudder). While some of the design elements themselves later became outmoded (such as wing warping and the canard), the innovation of combining these controls was a fundamental advance in flight control. The achievements of the Wright Brothers would have an enormous impact on the future of aviation and the science of aeronautical engineering. And though Wilbur would sadly pass away in 1912, Orville Wright would continue to play an important role in the progress of aviation. This included the next phase of its development as man set out to conquer the world of global transportation and passenger air travel, as described in the featured article, The Birth of Commercial Aviation. Orville helped oversee the Guggenheim Fund for the Promotion of Aeronautics, which helped America recapture the technological lead in aviation during the 1920s, and was awarded the first Daniel Guggenheim Medal in 1928. He was also offered the first official pilot’s license issued by the U.S. Federal Government in 1927, though he deferred the honor to William P. MacCracken, Jr. Additionally, he was on the original board of the National Advisory Committee for Aeronautics (NACA), which later became the National Air and Space Administration (or NASA). Appointed in 1920, he served longer than any board member since.